My first time in Sarajevo was in 2013. In 2 years I went back 4 times.. My family from Norway have two houses in Bosnia, and one of them is in Sarajevo. From the first moment i fell in love with Sarajevo, one moment you are walking down old Ottoman streets and the next into Austrian styled more modern streets. What started out as me coming to Sarajevo as a tourist, in time i became a local. I got to know the workers at local bakeries, cafes and shops. It felt like home. More than Sydney ever did. Everyone that comes into Bosnia by plane land in Sarajevo, the country’s capital city. Some know the city as the site of the assassination of the Archduke of Austria in 1914, which then started WW1, others remember the city from thr 1984 Winter Olympics. But many remember the city during the war, for nearly four years from 1992-1996 the city suffered the longest siege of a city. Since the end of the war Sarajevo has been undergoing post war reconstruction and is the fastest growing city in Bosnia & Herzegovina. The earliest known name for the large central Bosnian region of today’s Sarajevo is Vrhbosna. Founded in 1263, Sarajevo, then a citadel known as Vrh-Bosna, fell to the Turks in 1429 and was renamed Bosna-Saraj, or Bosna-Seraj. The city was a center of the Serbian nationalist movement. The assassination in Sarajevo of Archduke Francis Ferdinand and his wife on June 28, 1914,was an immediate cause of WW1. In 1984 the city was host to the Winter Olympics. Had the longest siege in modern history, almost 4 years with constant shelling. When you are in Sarajevo it doesn’t feel like other capital cities. There are tourists yes, but not to the point where you cant find a seat, or feel like its too busy. It is a city of many cultures, religions and faiths. Walking down the old cobbled streets of Bascarsija you cant help fall in love with this old yet new city. The smell of fresh bread from the pekara (bakery), the taste of cevapi from the famous Zejlo, eating way too many tufahija (poached apple stuffed with walnuts and cream), baklava and drinking Bosnian coffee (similar to Turkish coffee). You hear the ezan call for prayer 5 times a day, even if you are not religious like me you get goosebumps from the beauty of it. Even though alot of the city has been getting a paint job, it still shows its war scars. Many buildings still have bullet holes and shelling. You can just imagine the life these people led, the risk of death everyday if you left your house to get food and water. Alot of people especially the elderly haven’t recovered. Many lost their families, homes and everything with it in the war. But their spirit and perseverance to make a better life for themselves and their families can be seen. The city like any capital city is safe as long as you are aware of your surroundings and dont leave your valuables unattended. Below are just a few tips to stay safe, that i have learnt and picked up along the way. One sad thing about Bosnia & Herzegovina you will notice is the poor people. But dont mistake the roma gypsies for poor and homeless Bosnian citizens. The roma gypsies are spread across Europe and they have lived like this for hundreds of years. Despite being harmless, i was told by locals to not help their situation. They (adult roma) use their children of all ages (some young newborns) as money makers. The children beg locals and tourists (who often fall for it), saying they have no money and they are hungry. But your money will not go to feed these kids who are dressed in old raggy and dirty clothes. Instead they bring it back to their parents who are known to buy smokes and drinks with their makings. I was also told they often drug their kids so they look sick and tired and they brainwash these kids into this lifestyle of begging. Instead of giving kids a proper childhood of playing and enjoying time with friends they are forced to walk the streets even at night, begging for money. There are the few that work, or sell things in the market for money though. I have to admit i sometimes gave in, sometimes because i felt bad, other times to just make them go away, because the older kids dont take no for an answer. Another sad thing about Sarajevo is the amount of stray dogs. Bosnia passed a law few years ago banning the killing of strays. But people ignored the law, largely because authorities failed to provide alternatives such as sterilization. Many illegal dog catchers can be seen catching dogs to kill them. Killing and abuse of animals is a criminal offence in Bosnia, but authorities are not interested in investigating the cases in order to punish offenders. Being a owner of two cats myself this makes me so sad. You can read HERE more about it and how you can help. There is a government shelter but they are run down and arent the best home for them. Dont be alarmed about them. Be cautious of your surroundings like anywhere else, esp at night but unless you provoke them, they wont attack. Locals help take care of them, they give them scraps, are tolerant if the dog comes back for more and lays down all day in front of a shop or cafe. Taxis are cheap. BUT be aware of their monopoly game. A 2.5 KM (Bosnian convertible mark) start and 1KM for every KM (kilometre). Much cheaper than Sydney! I dont remember the last time i took a taxi in Australia. But be aware of taxis. Many arent legal and will try scam you of money especially if you are a tourist. They must have a meter running. The taxis generally all have the same costs, and waiting time is 10KM for an hour. The best company i have found is yellow or red taxi. Others may just be the guys car and he is running it illegally which i found out you can get a fine for it the cops catch you! Yep, you can get a fine even if you dont know he isnt a legit taxi company. Avoid getting a taxi at the bus station. There are usually 3 taxis parked waiting for buses. If they can fit 3 or 4 passengers at a time they will do it, and charge you more. I came off the bus from a 6 hour drive from Dubrovnik, and had to be back home at a certain time. I told the taxi where i needed to go which was only a 5 minute drive. He said as there is so much people coming out needing taxis he will wait to get a few more people. Well this wait ended up being 25 minutes watching them all fight over who will take who. It was like being back in my sales job. They even charged a poor american tourist 25KM for a 5 minute ride. It should have cost her 7KM at the most. So i would always recommend calling a yellow taxi and tell them where you are. They will let you know what cab number they are. Many people i talked to said there have been cases where they been reluctant to turn the meter on, saying its not working or they dont have one. BY LAW they have to have it displayed. On the passengers window there is a sticker (or should be on good taxis) that states how much ride is per KM, waiting costs and about baggage costs. Here are the phone numbers for taxis that are honest and ones that ive used or have been recommended to me. If you dont have a local sim card you can ask a local near by if they can call one for you. Im sure they wont mind. 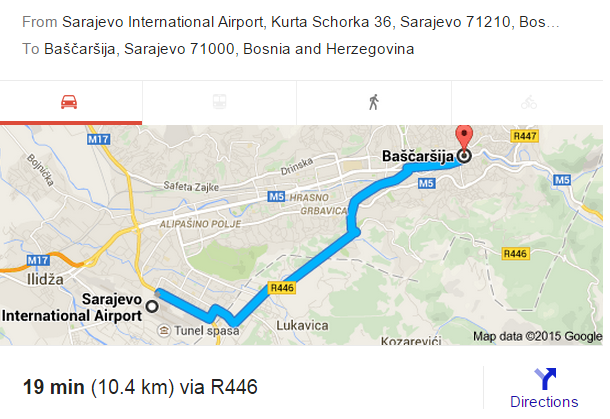 Crveni have taxi stand very close to the airport and will be there in a matter of seconds. Always check if they have the meter on, it is usually a 2.5MARK start then a MARK per Kilometer after. CLICK on the map and it should bring up GOOGLE MAPS. As you can see its about 1.4 from the citys center. This ride should be less than 15MARKS. Fortunatly Sarajevo airport has finally got public transport as of August 2016!! YAY!! Thanks so much for this useful post! I tried looking up online but couldn’t find any info on how long the bus journey might take. Based on your experience, what would be reasonable in terms of timing? 30 minutes? Not a problem! The buses are new, only taken into effect August this year, and due to my pregnancy I havent gone this year. I would say maybe 30 minutes due to stops along the way. Taxis in other countries are always something to be wary of. You never know exactly how much fare should be so it’s easy to be taken advantage of. Thanks for the helpful advice! Great intro to Sarajevo. Even though I have no family connections, I feel like we had a similar response to Sarajevo. It’s such a beautiful city! Oh and good recommendation on the taxis. I would add Holland Taxi to the list too. They’re good in my experience. Thanks 🙂 ive updated the page with phone numbers for taxis and included holland.